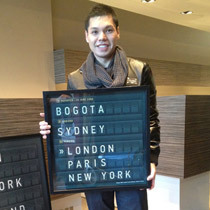 Khanh, Kellie & Toan organised an amazing 30th birthday present for Javier. 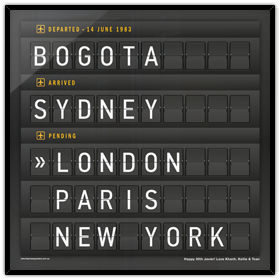 There's always a story in our airport boards... Javier moved to Sydney from Bogota in 1983, soon to travel to his must-see destinations. 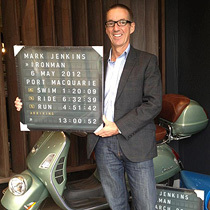 Take flight and personalise your birthday airport board in any way by adding all those special moments. Tell the birthday boy or girl, who it's from...add an inscription to the bottom right. . . I love it! Will see what the others think and let you know what special message we'd like in the corner. Thank you so much. It's a YES YES YES from everyone. Thanks again for your awesome work! .